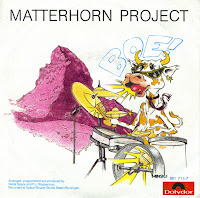 Stella and PJ Wassermann started the Matterhorn Project in 1985 with their debut single 'Muh' (titled 'Boe' in the Netherlands as a Dutch onomatopoeia). The record shot straight to number two in the Swiss charts and stayed there for three weeks. It was also a number 5 hit in South Africa, amazingly enough. I heard this single thanks to my sister who had bought it. I bought my copy some time later at discount price. As with many novelty singles, the joke does wear thin after many times of playing the track. But the Matterhorn Project still goes on, as is demonstrated by their own website.